My children are involved in all sorts of musical activities. 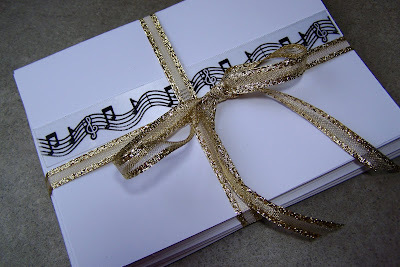 For a favorite music director we made a set of note cards. This idea was inspired by one of the gazillion craft lists I’m on. Sadly, I can’t find the link. 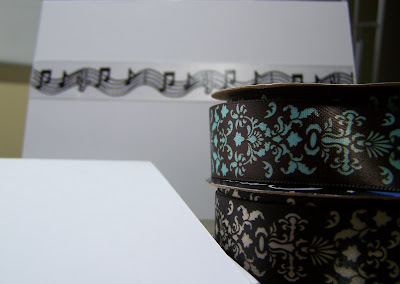 But you start with some ribbon. Grab closest ribbon and present! So simple, even a 17 year old boy and non-crafty 16 year old girl could do it! Problem is, Christmas is to musicians as tax season is to accountants…busy! So….mom made them. I hope you are enjoying your Christmas preparations! Those earrings are adorable! Thanks for the info about the ribbon notecards, that’s a nice idea. I like that it’s simple to make. Adorable, Jane! Love the cards! Human contact with writing…….great gift idea. Their teacher will love those notes. Simple is sometimes best! Gabrielle sent me some handmade cards with pieces of torn book pages (decoratively torn, that is) adhered to the front and they are SO darling. I always make things more work than they need to be, and sometimes just a sweet little simple “something” is perfect. 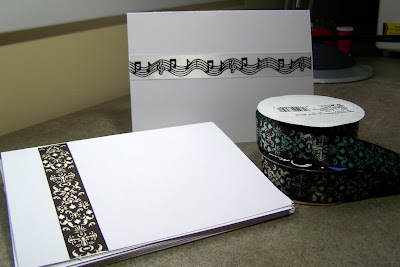 We’re thinking of all the old ribbon and lace in our stashes… we could make oodles of cute card sets out of them!